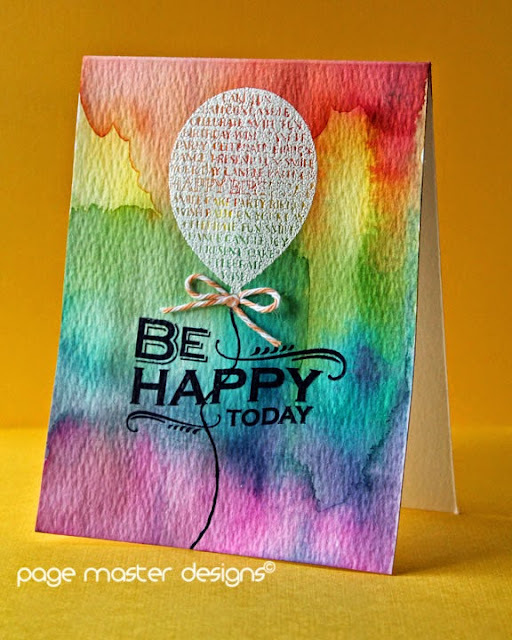 Page Master Designs Online: Be Happy! HI! I am taking the Online Card Class "Watercolor for Cardmakers" with Jen McGuire and Kristina Werner. I love these classes. So informative...so fun! Today's card is from Day 1's homework. While I had it done I haven't had the chance to photograph it. We just got a 7 week old Golden Retriever and he is a handful to say the least! LOL My other 2 dogs aren't so happy about him right now so I am lacking in "free" time. I hope this stops soon. I want to participate in every aspect of this class. Anyhow, today's homework shows how to create your own watercolor background. The awesome Laura Bassen showed this technique and I LOVED her card. I did mine a tad differently but I was thrilled with the effects. The colors used are all Distress inks. Both stamps are Hero Arts. Gotta run, pup is trying to eat my laptop cord. Gorgeous card. I love all the colors. Beautiful. I have nominated you for the Blog Your Heart Out Challenge - hope you accept.